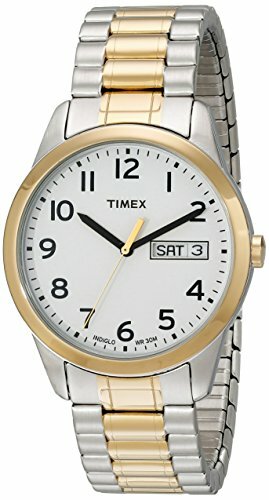 Showcasing a clean white face offset by black hour markers, the Timex Men's T2N063 Elevated Classics Dress Two-Tone Stainless Steel Expansion Band Watch nicely complements sophisticated business wear. Constructed with a brass case, the watch includes a stationary brass bezel and a comfortable stainless steel expansion wristband. A strong mineral window shields the white dial, which features large black Arabic numeral hour markers and a gold-tone seconds hand. The face also includes slim black minute indexes and a day-and-date calendar at three o'clock. Powered by quartz movement, this handsome timepiece is water resistant to 99 feet (30 meters).